Solver Support would like to inform customers that if they are getting a message saying that their license is going to expire in 30 days (see screenshot 1) and they feel that their license should not be expiring, that all they need to do is go into the Administration Tool -> License Management and click 'Update All Licenses' (see screenshot 2). 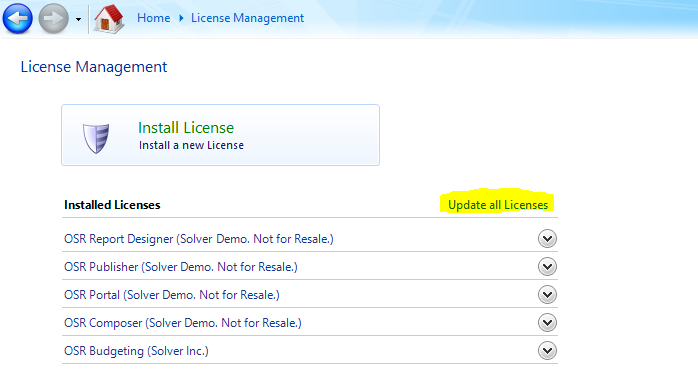 Screenshot 2: Click "Update All Licenses" to update the expiration date (Administration Tool -> License Management). If you have any questions, please feel free to submit a support ticket at support.solverglobal.com.